I'm on a greens kick. This week my Full Circle Farm box included Swiss chard, beet greens, and domesticated dandelions. Despite having made two Hortopitas in the last week, I wanted more greens. For the sake of variety, I made Plasto instead of more Hortopita, and mixed the bitter greens from our garden with the sweeter Full Circle Farm varieties. I discovered Plasto leafing through an old Greek church cookbook (St. Nicholas Orthodox Church: Greek Kouzina, Ann Arbor, Michigan, 1980), one of nearly 400 Greek cookbooks in my collection (a tribute to irresistable impulses and obsession). This Plasto recipe sandwiched spinach between two layers of Jiffy corn muffin mix. The recipe details were uninspiring, but the concept of mixing greens with cornmeal in a single dish intrigued me. Despite years of studying Greek cuisine, I had not heard of Plasto. 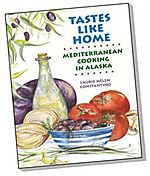 I quickly searched through my cookbook collection, and did not find a single other recipe for the dish. 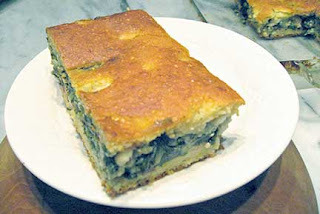 I searched the internet for any Greek dish combining greens and cornmeal and found 19 pages of recipes combining the two ingredients, most in Greek. Although the recipes were similar, they had a full orchestra of names: Patsaria, Blatsaria, Batsaria, Batzara, Blano, Plastos, Plasto, Plastira, Pispilita, Paspalopita, Bobota, Bobotopita, Babanetsa, Spanakopita Epirotiki, Hortopita with Kalambokalevro (Cornmeal), Pita Masodra, and Lachanopsomo. The recipes emphasized different dimensions of the cornmeal and greens combination, but none seemed exactly right to me. Either the cornmeal layers had an undesirable consistency, or the greens mixture was too bland, or the greens were cooked into a slurry. I developed a recipe that may not be traditional, but it fulfills what I had imagined when I first saw the Plasto recipe. The top cornbread crust is browned and beautiful, and the juicy filling bubbes up the sides of the pan when it comes out of the oven. It smells great. When cut, the sight of the golden cornbread crust, and the deep green filling studded with white pockets of cheese, makes my mouth water. The crunchy cornmeal crust of Plasto contrasts nicely with the softer texture of the filling. And in the filling, the herbs, greens, cheese, and onions meld with greens to form a single flavor, bringing out the best in all the ingredients. Leftovers: Leftover Plasto makes a delicious cold meal, as the filling's flavors continue to develop over night. It may even be better cold as a lovely cornbread and greens sandwich. When I first tasted Plasto hot, I was sorry I had not made it with feta cheese. However, when I ate it cold, I basked in the correctness of my decision to use goat and cottage cheeses, whose flavors are more subtle than salty feta. Plasto is a recipe for days when I want something not too complicated and reliably good. Preheat the oven to 400F. Grease a 10x10” pan with butter. Wash the greens, and blanch them in boiling salted water. Drain and, using a kitchen towel, squeeze out as much water as possible from the greens. Chop them roughly. Sauté the onion, lightly seasoned with salt and freshly ground black pepper, in olive oil over medium heat until the onions soften and begin to turn golden. Stir in the Aleppo pepper. Mix together the chopped greens, sautéed onions (including the oil), dill, mint, and cheese. Season to taste with salt and freshly ground black pepper. Mix all the dry ingredients for the cornmeal layer together. Whisk together the eggs, yogurt, and water until the ingredients are well blended. Melt the butter. Stir the egg mixture into the dry ingredients until they are almost, but not quite, completely mixed. Stir in the melted butter just until thoroughly combined. Spread half of the cornmeal mix over the bottom of the buttered pan. Spread the greens mix over the cornmeal layer, and then spread, as evenly as possible, the remaining cornmeal mix over the greens. Bake in a preheated oven for 45 minutes, or until the top crust is golden brown and the filling is bubbling up the sides of the pan. Let the Plasto rest for 5-10 minutes before cutting and serving. 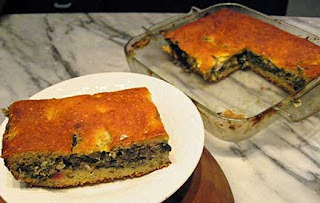 Serve with Tomato and Onion Salad and Baked Kalamata Olives. This is my entry in the Grow Your Own monthly food blogging event. This is also my entry for the Vegetarian Awareness Month event hosted by Margot of Coffee & Vanilla. Margot's summary of all VAM entries is here. Please check back soon for the round-up, I will be preparing it tonight. This sounds like good home fare! Thanks for a great entry for Grow Your Own #3! Hi Laurie, I found your site via the CLICK event, but I've been enjoying all your posts. I love the way you cook and what you cook! I'm probably going to try this greens and cornbread recipe sooner than later. Never met a green I didn't like, and I do love corn. Mind if I put a link to your blog from mine? hi there from windy, warm and forest-fire struck Greece! i just read your latest, new-to-vista entry, and about PLASTO. as a canadian doing Greek cooking for 37 years now, i have often wondered why we must boil the greens for a pie. i fry the onions, or leeks, or both, and add the washed,chopped greens, whatever they be, to the pan when onions are ready, cover the pan and allow greens to wilt. if i feel they may be tough for some reason, i allow a couple of more minutes after the wilting. Hi Carole! Thanks for visiting. There are two reasons that I blanch the greens. The first is to remove most of the moisture so the crust doesn't get soggy. I not only blanch them, I also squeeze as much water out as I can after doing so - something you can't do when you saute the greens with the onions. The other reason I do it is when I'm using bitter greens and want to eliminate a little bit of the bitterness - blanching works well for this purpose. I hope you are enjoying your summer and thanks again for visiting!